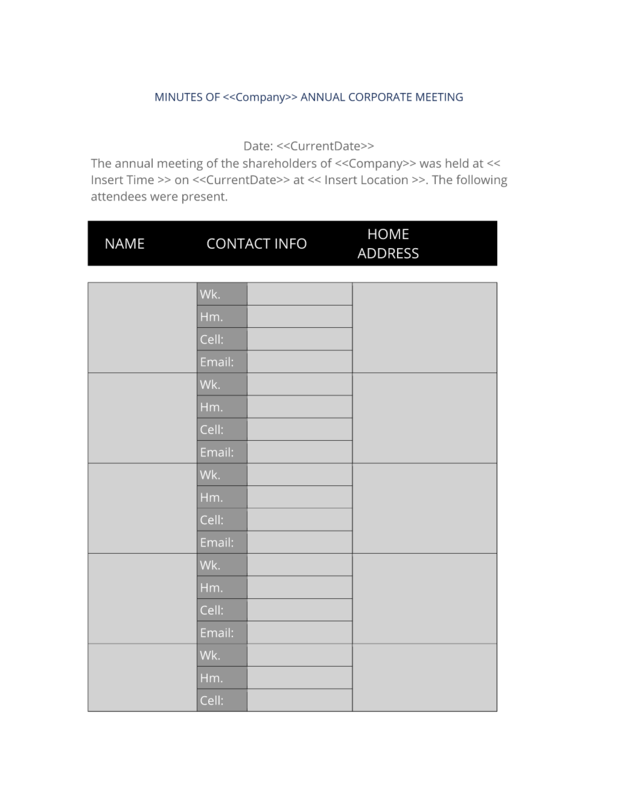 The Annual Corporate Meeting Minutes is a report form for listing the parties for a company's annual report minutes. I have found to be very thorough. This is one of the most impressive attributes of the Proposal Kit Pro. I really appreciate all of the work that has been put into this - it has made my job much easier and freeing up my time do work instead of preparing legal documents." This Annual Corporate Meeting Minutes is included in editable Word format that can be customized in Word or by using the included Wizard software. MINUTES OF Company Name ANNUAL CORPORATE MEETING. The annual meeting of the shareholders of Company Name was held at Insert Time on Current Date at location. The following attendees were present. Insert Chairperson was appointed to be Chairman/Chairwoman of the annual meeting. Insert Secretary was appointed to be Secretary of the annual meeting. The complete Annual Corporate Meeting Minutes - with the actual formatting and layout - is available in this Contract Pack.